National parks are often billed as places of change and integrity (even by me), where nature can take its course. Yet, they face unprecedented challenges and are managed so that nature doesn’t take its course in many cases. Some parks cull wildlife through controlled hunts or periodic roundups (Wind Cave, Badlands). Biologists occasionally control one species to benefit an endangered animal (Cape Cod). Now, the National Park Service has developed a draft plan to prevent the extirpation of wolves from Isle Royale National Park in Michigan. Plans such as this, which suggest increasing levels of intervention in ecosystem management, are the future of conservation in national parks. This is a future, and a current reality, where humans have so fundamentally altered the planet that nature doesn’t exist outside our influence. Parks aren’t pure anymore. In the early 20th century, national parks and monuments were managed primarily for aesthetics, spectacle, and recreation. Park superintendents and rangers had preconceived notions of what parklands should look like and the experiences they should provide visitors. Caves were manipulated and became showcases to march people through sensitive areas. Predators like wolves and mountain lions were vilified and persecuted. Bears were a sideshow. Feeding them at dumps and roadsides was often encouraged. Insecticides were sprayed to control native insect outbreaks. The long-standing philosophy was: parks ought to be pretty and tidy. As respect for wilderness and ecological integrity grew, people began to reconsider how national parks were managed. In 1963, an advisory board for the Department of Interior issued Wildlife Management in the National Parks, or the Leopold Report after the board’s chair, A. Starker Leopold. Admittedly “conceptual,” the Leopold Report fundamentally altered natural resource management in parks. The Leopold Report catalyzed a time of real soul searching for park managers. The report asked, “How far should the National Park Service go in utilizing the tools of management to maintain wildlife populations?” It acknowledged that few parks are large enough to be self-regulating ecosystems. It went further by stating the biological communities in parks are artifacts and that management is often essential to maintain some biotic communities. The report famously recommended the National Park Service manage parklands as “vignettes of primitive America,” a philosophical shift that on the surface represents a more pure vision of what national parks should and could be—places that resemble the prevailing conditions experienced by the first Europeans. While noble, this ideal is wrought with fallacy. The Leopold Report admitted primitive America could never be recreated fully. Just to list a few examples: passenger pigeons are extinct, American chestnuts are functionally extinct, wild bison almost became extinct, and wolves were extirpated across most of their range in the United States. It also made no accommodation for Native American use and manipulation of the land. Essentially, any recreation of “primitive America” is artificial, but something to strive for. What should we do when the line blurs between maintaining a primitive landscape and acknowledging there is no longer any such thing? Isle Royale National Park is one of the most recent parks to grapple with this issue. Isle Royale is the largest island in Lake Superior, sitting about twenty miles east of Grand Portage, Minnesota, and most of it is designated federal wilderness. The upper Great Lakes region was one of the few places in the Lower 48 states where wolves maintained a foothold throughout the 20th century, but Isle Royale was wolf-free in the early 1900s. Wolves only returned to the island in the late 1940s after crossing the ice on Lake Superior. Only two wolves were observed on the island in 2016 (the historical average, according to the draft wolf introduction plan, is 20-30). The population plummeted because disease (canine parvovirus) and a lack of connectivity with the mainland reduced genetic diversity. The animals are now extremely inbred and remain in a genetic bottleneck they probably won’t escape. Even though Isle Royale has numerous moose (the wolves’ primary prey), the wolves will likely disappear from the island without human intervention. Is it wrong to let the wolves disappear? Yellowstone National Park’s effort to reintroduce wolves is the most famous wolf reintroduction program in history. It is also a remarkable success, from the standpoint of the wolf. The reintroduction of wolves arguably shifted the ecosystem into top-down mode where large predators like wolves exert strong influence on the behavior and abundance prey species. Yellowstone’s effort corrected a wrong—people extirpated the park’s wolves through hunting, trapping, and poisoning. Now, a strong case can be made that humans are driving Isle Royale’s wolves to extirpation, just in a less obvious way. At first, disease and a lack of connectivity with the mainland seem like natural influences, after all Isle Royale is an isle and many diseases infect wolves. Canine parvovirus is not native to the island, however. This disease caused the wolf population to decline drastically in 1981, from 50 to 14, and the population has never fully recovered. Wolves immigrate and emigrate from the island over ice bridges on Lake Superior. A warming climate trend has drastically reduced the frequency of the ice bridges, so much so that only one formed in the first decade of the 20th century. As the climate continues to warm, ice bridges will form less and less. For those reasons, you could easily make a case that humans precipitated the decline of wolves and therefore we should intervene. The island would become a different place without wolves. Vegetation changes would become more pronounced and happen at a faster rate. Moose browsing threatens the persistence of big-tooth aspen, red oak, and balsam poplar on the island, but vegetation changes are not tied to moose alone. 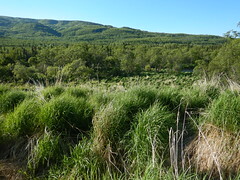 Computer models indicate many dominant tree species (balsam fir, white spruce, black spruce) may disappear from the island due to a warming climate. Paper birch and quaking aspen are expected to undergo serious declines. Park managers expect that in the presence of wolves, moose herbivory would be less likely to exacerbate climate change’s influences on vegetation. Looking at the issue from the perspective of ecosystem health and biological integrity, the presence of wolves is probably necessary to prevent habitat degradation, or at least slow it. Therefore, should we intervene? The NPS thinks so, and I don’t necessarily disagree. There is no ecological difference between humans supplementing wolves on the island and wolves immigrating naturally across an ice bridge. The only difference is mental, cultural. We’d know we did it. We’d know we manipulated the ecosystem. We know we messed with primitive America. For some people, that trammels the island’s wilderness and severely impacts its natural quality. We need to get over any of that if we want to maintain some biological integrity in the future. In The End of Nature, Bill McKibben argues that by burning fossil fuels, we’ve fundamentally altered Earth’s atmosphere causing global warming, and nature, as it is classically known (the physical world outside of humanity and human creations), no longer exists. Now, not even the deepest ocean trenches are free of our fingerprints. There is no place untouched by humanity. Even if we did not alter climate, humans are so numerous and so thoroughly dominate most terrestrial ecosystems that McKibben’s hypothesis would still stand. We impact the evolution of life on Earth. Recognizing that much has changed and much has been learned since 1960s, a National Park System Advisory Board revisited the Leopold Report in 2012 and recommended the NPS manage for constant change, instead of striving for a past ideal. Isle Royale’s plan could be supportive of the old and new philosophies. Wolves are valued members of a primitive America, but under current and projected future climate conditions, Isle Royale’s wolves may indefinitely need a helping human hand to remain viable. If we value wolves on the island, then we’re probably committed to supplementing population in perpetuity. Revisiting Leopold recommends the NPS expand their management strategies to encompass a geographic scope beyond park boundaries. If parks, in order to remain ecologically viable, need greater habitat connectivity to other wild lands, then they should forcefully advocate for that. We can no longer pretend national parks are vignettes of primitive America. Wilderness areas can no longer be considered “untrammeled” and “affected primarily by forces of nature” as stated in the 1964 Wilderness Act. We have to choose what parks represent and what they protect. I’m not opposed to any of the alternatives proposed to introduce wolves to Isle Royale. It’s probably wrong to let wolves disappear from Isle Royale because climate change limits the chances of more wolves immigrating to the island naturally, but there are a lot of threats to biodiversity and we need to choose our battles wisely. We won’t be able to intervene in every Isle Royale-like scenario. Are we any more intelligent or sophisticated than managers, rangers, and park visitors in the 1910s and 1920s when wolves were more vilified? They could’ve left animals alone to do their own thing. They didn’t, because they didn’t want to. Because, American culture said we should do otherwise. Now, we face a lot of the same questions. What do we value most in parks? How should we protect the things we value within them? I like to believe, sometime in the future, humans will have voluntarily reduced our footprint enough so that most plants and animals can evolve without our influence. We’re not there yet, certainly not with 7.4 billion of us living in a market economy driven largely by greater and greater levels of consumption. So, yeah, we should help Isle Royale’s wolves, but let’s not pretend national parks are pure wildlands. There is no purity in national park ecosystems anymore. Perhaps there never was. Photo courtesy of Isle Royale National Park. More Snow? Yes, More Snow. Yesterday, I wrote about a ski trip in Stehekin Valley’s ample snow. Since I took that trip a few days ago, more snow has fallen. A lot more. This was the scene I woke to yesterday. And, snow was slowly enveloping the neighbor’s house. This is nothing abnormal for the region, and in many way’s it is expected. In winter, the jet stream over Alaska and Canada shifts south over the Pacific Ocean. Air masses traveling across the Pacific at this time of the year are “immodestly moistened,” as Daniel Matthews describes in Cascade-Olympic Natural History, bringing heavy precipitation to Washington, Oregon and California. The Cascade Mountains and Sierra Nevada are effective moisture traps for these storms. When storms encounter the mountains, the air rises and cools causing it to precipitate its moisture. The Stehekin Valley in Lake Chelan National Recreation lies east of the Cascade Crest, so the area experiences drier weather than the wetter Skagit River valley to the west. However, the valley is not far enough east to experience the Cascades’ full rain shadow, hence the ample snowfall recently. In my estimation, at least three feet (approximately 50-100 cm) of snow has accumulated over the past five days, much of it falling in the last 24 hours. Higher elevations certainly gained more. I was curious to know the exact snow depth near my house, which lies at a modest 1100 feet (335 meters). After the snowfall abated yesterday afternoon I got out the snow shovel prepared to dig in. I chose to measure the snow out in a small meadow away from the influence of trees, but getting there took some effort. The first few feet of snow was very soft. The base to stand on, if you could call it that, was well under the surface. …and digging and digging until I reached the soil. The pit was over 65 inches (166 cm) deep! Long time residents describe winters with lots of snow and occasional rain too. Rain compacts the snow, increasing its density but decreasing its depth. This winter, I’m told, is a bit of an exception with lots of snow, but without temperatures warm enough for the occasional rain storm. Winter snowfall is essential to the well being of millions of people across the West, especially farmers who cannot depend on summer rain to sustain crops. Snowmelt in rivers quenches the thirst of residents in Los Angeles, Las Vegas, Phoenix, Salt Lake City, and many, many other places. It’s a reservoir, slowly releasing its water in spring and summer when it is needed most. Climate models indicate changing weather patterns will come to the West as temperatures rise. The North Cascades region won’t be without snow, but changes will be felt, and in a lot of ways the region is already experiencing them. More rain will fall and less snow will collect on the mountains. At first this may seem insignificant. However, this will change the timing and duration of peak stream flows. Currently, stream discharges peak in the spring and early summer when snowmelt is heaviest. The pattern seems to be shifting toward more frequent peak flows in spring and fall. Rain on snow events can cause heavy flooding, damaging roads and homes. (Stehekin River has experienced three 100 year floods since 1995.) Warmer springs temperatures melt snow faster, affecting sensitive habitats like montane wetlands, places that harbor sensitive species like the Cascades frog. Soils dry faster without snow too, increasing the risk of wildfire. When I think about how climate change may impact my home and the people and places I care about one example resonates strongly with me. Sockeye salmon jump at Brooks Falls. When I lived in southwest Alaska, I marveled at the return of sockeye salmon each summer. These extraordinary fish endure weeks, even months without food after they reenter freshwater. Instincts and memory drive them upstream to conditions they cannot know until they get there. Finally, they sacrifice their lives to reproduce. Salmon are Katmai’s keystone, yet climate change may threaten these fish that sustain so much of the region’s ecology and economy. Ocean acidification is a by-product of climate change. Not all the CO2 we pump into the atmosphere stays there. Plants use it during photosynthesis and the oceans absorb it. At first glance, the ocean’s capacity to absorb CO2 seems like a good thing, because less CO2 will be in the atmosphere to trap heat. In the ocean however, high concentrations of CO2 impact the base of the food web through a process of ocean acidification. H2O plus CO2 forms a weak acid, H2CO3, also known as carbonic acid. In ocean water, carbonic acid makes the water more acidic by releasing a hydrogen ion, which combines with carbonate ions, CO32 to form bicarbonate molecules (read more about the chemistry involved). Ocean water is normally supersaturated in carbonate, which many species of plankton need to build and maintain their shells. When ocean water becomes more acidic, less carbonate is available for certain algae and animals grow and maintain calcified shells. Calcium minerals used in shell building dissolve in acid, even weak acids like carbonic acid (that’s how most limestone caves are formed), so if you’re a tiny bit of plankton then a small dip in pH can have dramatic affects on your shell. 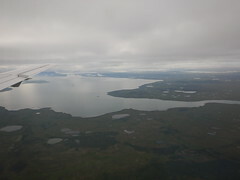 How would a decline in marine plankton affect Katmai’s terrestrial world? Follow the food chain. Ocean acidification impacts the base of the food chain. More acidic oceans can mean less food for salmon. Sockeye salmon primarily eat aquatic invertebrates while they travel the open ocean. 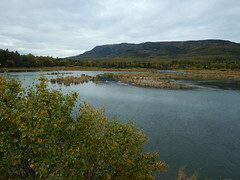 When they return to fresh water, salmon feed Katmai’s wolves, bears, trout, char, even plants. Katmai’s world famous bears are adaptable enough to survive dramatic climate shifts, but only if they have adequate habitat to adjust. Adequate habitat means food. 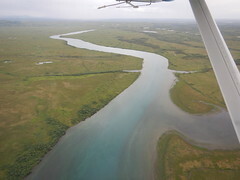 Without large runs of salmon, bear densities in Katmai would plummet. 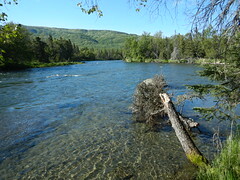 The gathering of bears at Brooks Falls will become a memory and Bristol Bay’s economy, based on the salmon fishery and salmon based tourism (sport fishing and wildlife viewing) would collapse. Salmon are the most important food source for Katmai’s bears. In a few more years, maybe it’ll be easier to grow tomatoes in Anchorage, but climate change’s worldwide consequences outweigh any potential benefits. Climate change is one of the greatest issues humanity faces, and if left unmitigated it may exacerbate every other environmental issue. Climate change is real and humans are forcing Earth’s climate to warm. That’s not political, it’s scientific fact. Politics though drives efforts to mitigate climate change. Voters can make an impact this fall. For example, I got Washington’s Voter’s Pamphlet in the mail recently, and discovered Initiative 732 on the ballot. This initiative is modeled after British Columbia’s similar carbon tax. Turns out, that the tax was effective without slowing economic growth. However, some environmental groups oppose the initiative. While they may have legitimate concerns, we no longer have time to wait for something better. We’ve waited far too long to address climate change. This situation reminds me of the debate over the 1980 Alaska National Interest Lands Conservation Act (ANILCA), which permanently protect millions of acres of land in Alaska. The final version of ANILCA didn’t give environmental groups everything they wanted, but it gave Americans a whole hell of a lot. We didn’t have time to waste with ANILCA and we don’t have time to waste on climate change. It’s time for all of us to step up and sacrifice a bit for the future. I’m glad to see to that Washington voters are considering taking action to help mitigate climate change. I voted early and I voted yes on Initiative 732. If you live in Washington, I think you should as well. Wherever you live, vote for candidates who will take action on climate. I vote #ActOnClimate. I do it for salmon, bears, and people everywhere. For more information on climate change science: You can read the climate change chapter I wrote for Katmai’s Interpretation Training Manual, available for free from Earth To Sky’s website. Also check out Skeptical Science, one of the best climate science website I’ve found.